So “The Shred” starts in 2 more days and already The Sisterhood is giving away cool apparel. 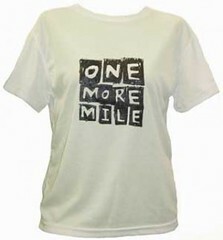 Follow the link for your chance(s) to win a fun workout shirt or tank top by One More Mile. And when I say “fun”, I’m talking about slogans like “Will Run for Margaritas”, “Find Your Happy Pace”, and “Running My Mass Off”. Doesn’t get any cuter than that!!! So go now and enter…contest ends Friday, April 10th.